Last week I visited the Lady Lever Art Gallery to see an exhibition of evening wear covering the 1930s and 40s imitating the glamour of Hollywood. The frocks and accessories chosen were taken from the archives of the National Museums Liverpool, mainly donated by Liverpool families. There were about twenty frocks in the exhibition and I'm going to split them over 3 or 4 posts and this is the first one. The dress is bias cut, enabling the dress to be stretched and closely moulded to the shape of the body. Evening dress, silk crepe and lurex, about 1934-38. Evening mantle, silk crepe-de-chine and marabou feathers, about 1930. The mantle's feathery outline contrasts with the sleek, column-style dress. The feathers come from the large African stork, which were used to trim luxury clothing. This frock was made by the Mainbocher fashion label that was created by the American fashion illustrator and designer Main Rousseau Bocher. It has little weights sewn into the hem to stop the dress lying about in the wind and to make sure it hangs properly. This dress has a small train at the back, but this style is still used for evening dresses today. 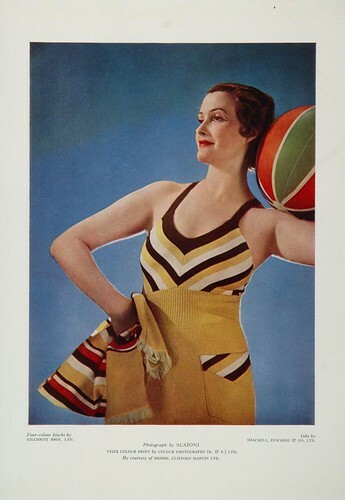 This striped dress is reminiscent of the beach wear that was popular during the 1930s. Evening dress with matching jacket, satin-backed crepe with applied beads and sequins. This outfit was made by the London couture house Lachasse, which was founded in 1929 and was still in business until 2006. This summer evening dress is typical of those made by local dressmakers during the late 1930s. Although the shape of this dress is simple, its vibrant colours and surface sheen gives it a glamorous and sophisticated feel. This dress was worn by Miss Doris Howard-Jones of Allerton, Liverpool. With its flowery pattern, this dress is one of my favourites of those in this exhibition. Again, it's something that you may come across in a clothes shop today. I hope you're enjoying seeing these beautiful dresses. There are more to come. Note: the second post about the re-opening of the Seagrass Gallery will be posted later this week.